I can’t quite believe that week seven of being here in the Glen has arrived so rapidly. The visitor season is now well into full swing with all the volunteer rangers having completed their first Land Rover safaris , all of which were successful proving that all the nerves were unnecessary. 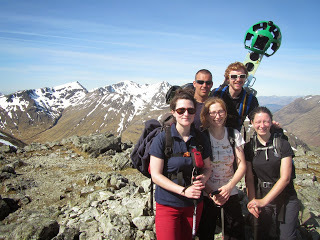 Lots of exciting things have been happening here, including the visit of Simon the NTS wildlife filming manager with Google Trekker, a rather unique and cumbersome article which we had to carry up the mountains while it takes constant panoramic shots of the surroundings. The idea is that this will enable Google to produce a website which can show people routes around areas such as mountains and deserts in a similar way to that of Google Street view in urban areas. In addition to Google Trekker we were lucky enough to get a master class on wildlife filming before being left to attempt to get some footage of wildlife in the glen which may be used on the new interpretation boards due to arrive at the visitor centre. We have been out filming Red Deer in the glen, practicing our filming skills (it’s much harder than it looks), we are also aiming to get some shots of badgers emerging from their sett, having set up a wildlife filming hide in what we hope is a prime location. We shall be spending a few, evenings up the side of a mountain in a cosy hide hoping they emerge before dusk. A couple of weeks ago children from Glencoe and Duror Primary Schools came to the visitor centre for a day based around pond life. Lindsay led the session, beginning with a story about Tommy the tadpole and his friends of the pond. To get the children learning about the lifecycle of frogs we all acted out the transformation that a tadpole undergoes, waggling our tails and popping out legs until we were fully fledged frogs. The children then split into two teams; the herbivorous waterboatmen and the carnivorous backswimmers. The race was on to collect as many green or red balls as possible before their bubble of air (a deflating balloon) ran out. In the afternoon we did some pond dipping to see these creatures in the flesh and had a few exciting extra discoveries, including dragonfly nymphs, baby newts and diving beetle larvae. 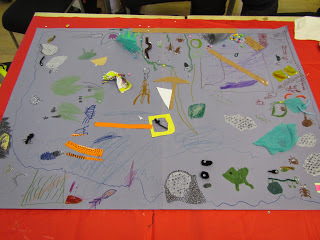 To round up the day the children made large collages of ponds to take back to their schools, featuring all of the pond life they had experienced throughout the day. 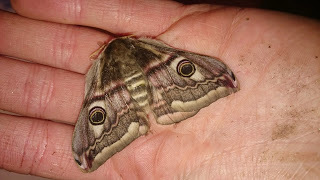 We have had some beautiful moths turning up in the trap recently, including a Lesser Swallow Prominent Pheosia gnoma, the larva of which feeds on birch, and a female Emperor moth Pavonia pavonia. This large and striking moth is brighter in Scotland than elsewhere in the UK and only turns up in our trap once or twice a year, so it could be the only one! The females fly at night and the males during the day, both overwinter as a pupa within a pear-shaped cocoon.